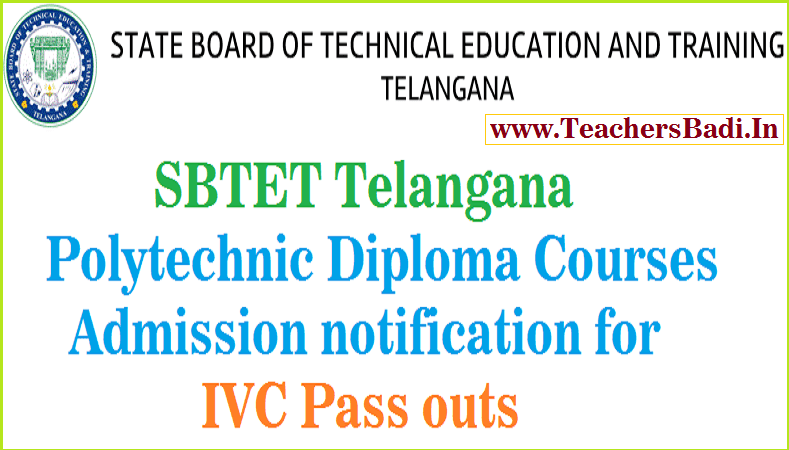 SBTET Telangana Polytechnic Diploma Courses Admissions 2018 for IVC Pass outs/Engineering or Non Engineering Diploma Courses Admissions/Download application form: Government of Telangana, Department of Technical Education has given the admission notification for IVC Pass-outs for Lateral Entry into Polytechnics and applications are invited from the eligible candidates for admission into 2nd year Diploma (Engineering and Non-Engineering) courses of 3-year duration offered at Govt / Aided / Private Polytechnics including 2nd shift Polytechnics running in Engineering colleges. Notification for Admissions into IVC and ITI Lateral Entry into 2nd Year Diploma Courses in Polytechnics: Govt. of Telangana, Department of Technical Education will invite applications from the eligible candidates of IVC/ ITI passed outs of Telangana /Andhra Pradesh(15% un-reserved Quota), for admission into 2nd year Diploma (Engineering and Non-Engineering) courses of 3-year duration offered at Govt./ Aided/ Private un Aided Polytechnics including 2nd shift Polytechnics running in Engineering colleges. Eligibility: Passed in two years Intermediate (Vocational) Course and passed in relevant bridge course (with Maths, Physics and Chemistry subjects), as applicable, conducted by Board of Intermediate Education. Who have passed two years Intermediate (Vocational) Course and passed in relevant bridge course with Maths, Physics and Chemistry subjects, as applicable conducted by Board of Intermediate Education are only eligible. Who secure 60% at ITI and also passed in bridge course Examination Conducted by SBTET, A.P. with Maths, Physics and chemistry subjects are only eligible. Candidates have to submit the applications from 26-05-2018 to 02-06-2018 to the respective Admission officers of University regions.